Mercedes-Benz R107 model series - The "Ockhuisen" Mercedes-Benz Collection. 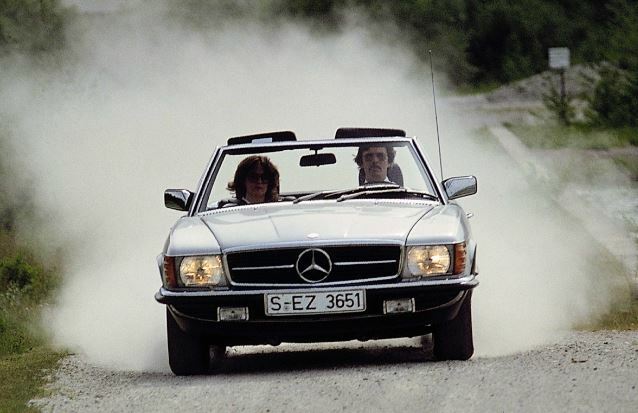 Stuttgart – Elegant and sporty, powerful and confident: the Mercedes-Benz SL R107 model series launched in the spring of 1971 was a classic Roadster embodying the very brand values which sum up the inventor of the motor car. After the SL models of the 1950’s and the 113-series “Pagoda” SL, the 1971 sports car was the third generation of this vehicle family. And it was a model series which proved to be a runaway success: the Roadsters remained in production for a period spanning more than 18 years. In the brand history of Mercedes-Benz, from the 1950’s the SL models represented a combination of innovation and appreciation for tradition as well as high standards of sportiness, comfort and elegance. 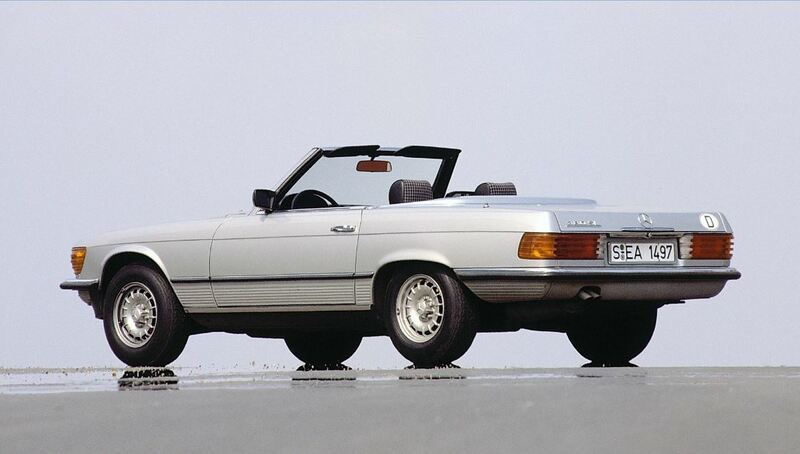 The R107-series SL Roadsters immediately expressed all of this in a particularly stylish manner: the open-top two-seater gave the impression of a strong, self-confident and imposing car. The fact that at the same time this Roadster was also designed as a comfortable touring car highlights a carefully thought-out detail: while the soft top typical of a Roadster provided flexible protection against the elements from spring through to autumn, for the colder months there was also a removable coupé hardtop – which blended seamlessly into the elegant lines of this sports car. 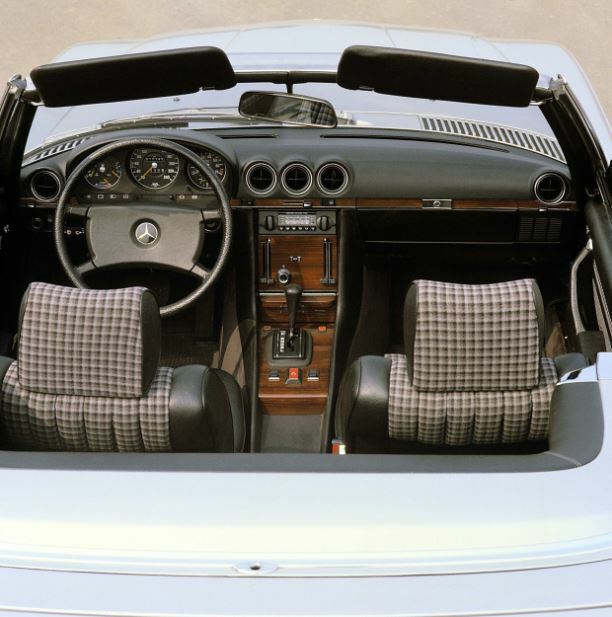 Technically, the R107 series SL models set standards, particularly with their comprehensive holistic safety concept: the crash behaviour of the open-top two-seater was far ahead of its time. This was thanks to the carefully designed crumple pattern of the body and shell structure, for example, as well as highly resilient A-pillars and interior appointments designed consistently in line with safety criteria. 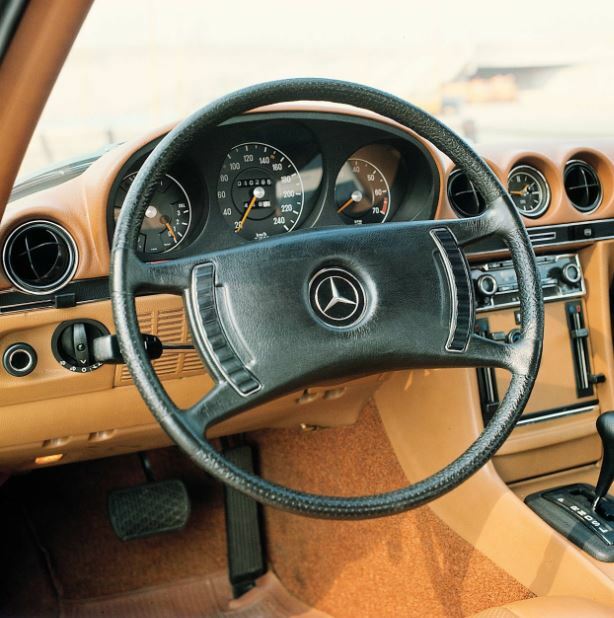 These included the heavily upholstered dashboard, the deformable or recessed switches and levers, and also the new four-spoke safety steering wheel with impact absorber and wide, padded boss. In addition, the fuel tank was no longer installed in the rear end but above the rear axle, protected against collision. The innovations in the area of active safety included measures to enhance being able to see as well as be seen: newly developed wind-deflecting mouldings on the A-pillars served to channel off mud-laden water in the rain and also kept the side windows clean, even in inclement weather. The wide wraparound indicators were also clearly visible from the sides, while the generously-sized rear lamps featured a ribbed surface profile to make them considerably more resistant to dirt build-up. Thanks to such details, the R107 series SL models were not only technical trend-setters for Mercedes-Benz passenger car development – which was repeatedly setting standards – but in the following years they also helped to define the style of Mercedes-Benz passenger cars. At the premiere of the 4.39-metre-long, 1.79-metre-wide and 1.30-metre-high (with roof closed) sports car in the spring of 1971, Mercedes-Benz initially presented the 350 SL model (147 kW/200 hp). 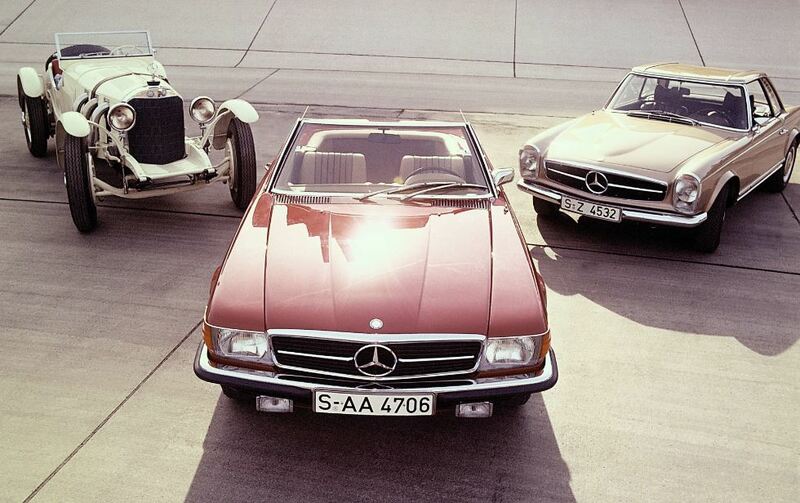 From the spring of 1973, the 450 SL model (165 kW/225 hp) then also became available in European markets. Both models were powered by V8 engines – this use of eight-cylinder units in SL sports cars was a first in the history of Mercedes-Benz. eight-cylinder engines. In July 1974 the Stuttgart-based brand launched the 280 SL with a six-cylinder in-line engine developing 136 kW (185 hp). As a result, three SL engine variants were now available – another novel feature in the history of this model class. Over the course of time, all of the engines were modified slightly in terms of their output values, so as to be able to comply more closely with the stricter emission limits which in the meantime were introduced in most European countries. 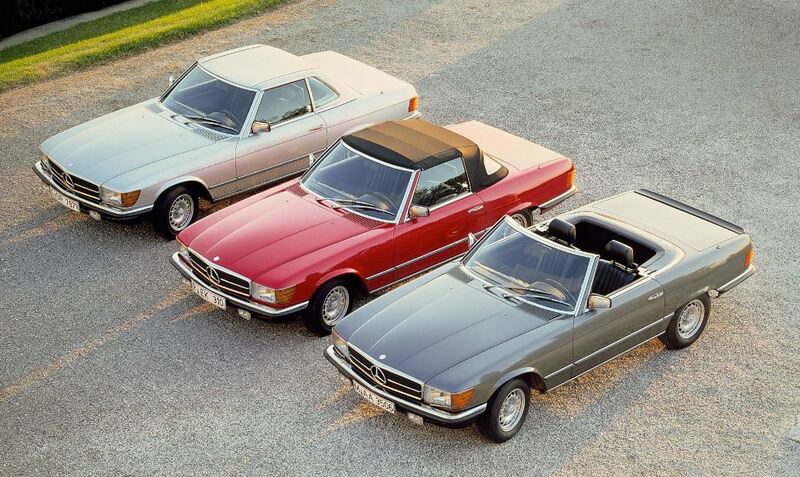 top-of-the-range model in the Roadster family, while the 350 SL was replaced by the 380 SL (160 kW/218 hp). 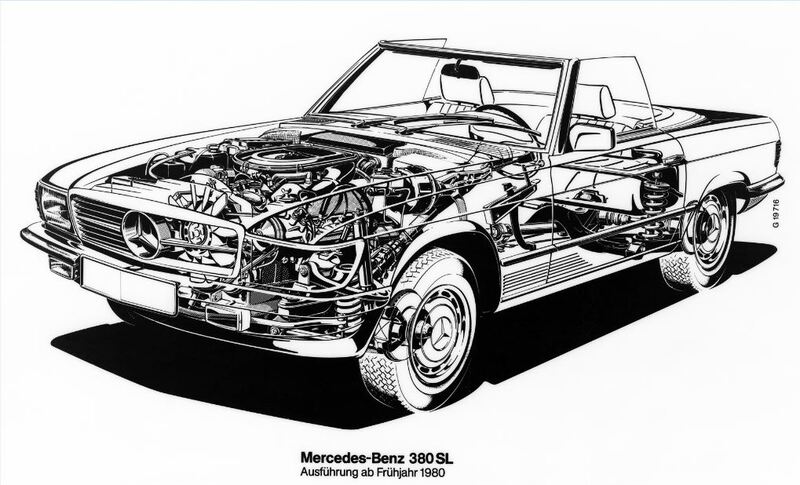 A further facelift in 1985 resulted in the 300 SL (138 kW/188 hp) as the successor to the 280 SL, and all of the engines were now optionally available with catalytic converter. A new addition to the range was the 420 SL with V8 engine (160 kW/218 hp without catalytic converter, 150 kW/204 hp with catalytic converter). The most spectacular new development was the 560 SL (170 kW/230 hp), which was reserved for the export markets of the USA, Australia and Japan. Despite the larger displacement, the 5.6-litre model was not as powerful as the 500 SL: the reason for this was the sophisticated emission control system fitted to enable the SL to comply with the particularly strict emission limits of the US market. From the moment of its premiere in 1971, the 350 SL already formed the basis, in both technical and style terms, for a four-seater coupé which was to replace the 111 model series luxury-class coupé, thereby becoming one of the forerunner models to today’s CL-Class. 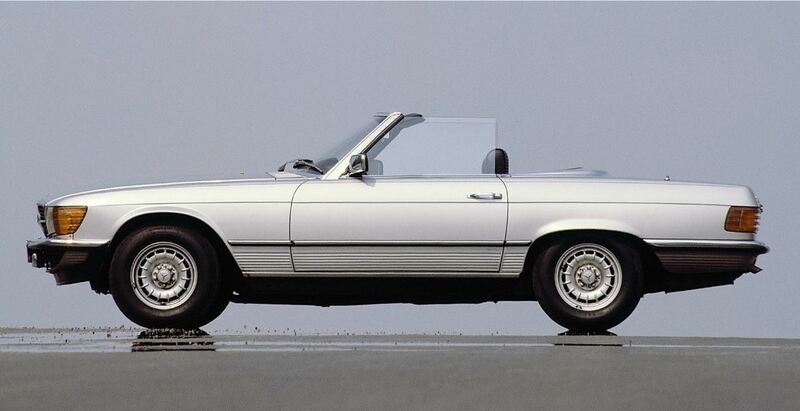 Starting with the 350 SLC launched in the autumn of 1971, these SLC models had a wheelbase which was 360 mm longer (2820 mm instead of 2460 mm), to accommodate the row of seats in the rear. The success story of the SL R107 model series ran from the spring of 1971 until the summer of 1989. During an era lasting some 18 years, the Mercedes-Benz plant at Sindelfingen produced a total of no fewer than 237,287 roadsters.